I was wondering if anyone knew anything about a 'hidden' house which is situated in the back courts of the Flats on the west-side of Arlington Street and east-side of Westend Park Street. Where you would normally expect to find bin-shelters, old mattresses and associated detritus the cooncil don't see fit to lift, there is a smallish two story house. I have no idea if this pre-dates the tenements. It would be a strange mews house as it isn't attached to any of the other buildings and is enclosed on all four sides. Indeed, I think it could only be accessed through the one of closes on Westend Park Street - there seems to be no other means of access. Be grateful for any information anyone might have... Thanks. Last edited by red_kola on Sun Sep 24, 2006 11:08 am, edited 2 times in total. I've never seen this before, but it looks like an old wash-house? I'll look into it, Ronnie may know something about it tho. Yep, that's it. Unless you live in that block you'd never know it was there. Was at a friends house on Saturday and noticed it then. 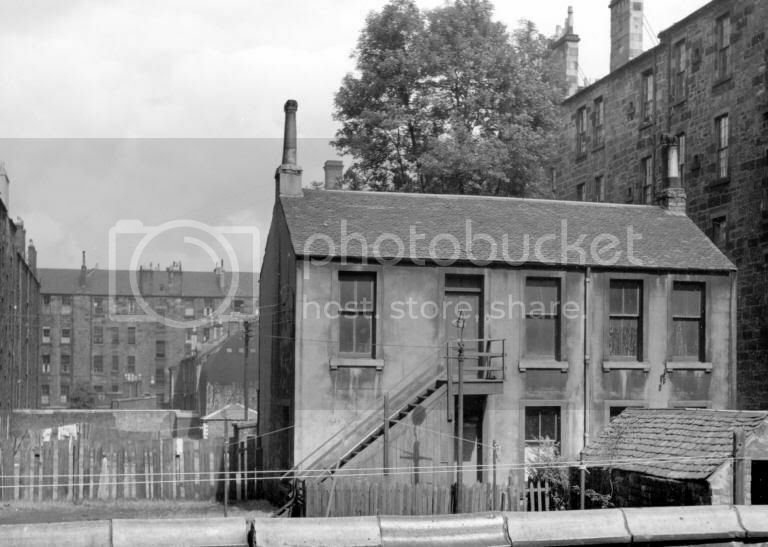 I know it looks like a wash-house, particularly in that old photo, but I've got a really vague recollection that a property fitting the description was on the market through Clyde Property a few years back. Well i have big news for you.. i used to live there!! It was a great house, i loved it.. i only moved out cos my girlfriend at the time decided to move in with my best mate (they just got married this weekend i believe ) and left me broke! you enter via 18 west end park street, go down the back stairs! so yes.. it does exist, and i hope one day i can move back there! i was just looking at that old picture again.. i just realised that old gas lamp is still there in the cottage's garden! cool! exdurandal wrote: Well i have big news for you.. i used to live there!! Have you got any idea of its history. It must pre-date the tenements, right? PS thanks to whoever edited my post. I deliberately did not inline the image as I thought it was too big, but since it seems not to be... cheers! I've got the 1861 census for Glasgow on CD. But annoyingly I can only search by name...so that's no bloody use whatsoever. I've got the 1881 census on cd, it lets you look up by address, but what address? This is the info for 18 Westend Park... could it be the empty one? exdurandal wrote: Well i have big news for you.. i used to live there!! It was a great house, i loved it..
Hi exdurandal, what was the address of the house when you lived there? i *think* it was either 1802 or 1798 that the house was reportadly built in. When i lived there, the old guy up stairs (i was in the lower half) had a news paper clipping from the early 20s which had been able to trace it back to about then. The actual house had lay derilict from about 1930 until the late 50s, then a guy had renovated it. it was beautiful on the inside, i hope someday to buy it, possibly the upper half too and merge them together.. it'd be the most perfect house for me. I'm gonna have a look see if i have any pictures from the inside of it, so keep checking back.. if i have any i'll post them! the address was Flat 0/1 18 West End Park Street, Glasgow, G3.. can't remember the rest of the post code. Found out some more about the house. It was called Woodside Cottage, with a postal address - before the tenements were built - of 86 Woodlands Road. In 1843 it was owned by David Brown, landscape gardener and nurseryman, and was surrounded by a market garden or nursery. It may have been built before that. Later in the 19C it was the premises of Annan the photographer. (from James Cowan, "From Glasgow's Treasure Chest", Glasgow, 1951).